I'm currently reading Pat Miller's book Play With Your Dog (you can buy this book at amazon.com and other places). 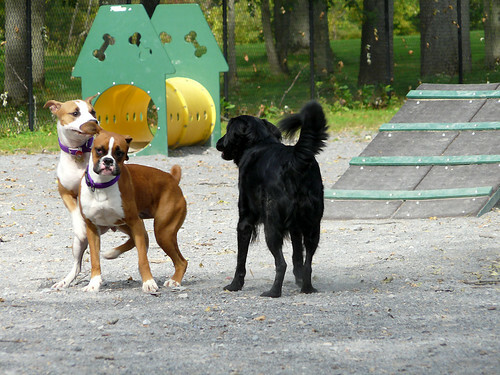 This subject is especially interesting to me because play is one major thing we humans share with dogs. But I also find it fascinating because play is one thing Dahlia struggles with the most. When she first came to live with us, play was completely alien to her. She didn't understand toys. She didn't understand fetch. She didn't understand a dog's play bow. There was nothing she did that could be deemed playful, unless you found her sad attempts at herding us (by trying to grab onto our pant legs) as "playful." In the two years since then, she's started to get it more and more. She loves her squeaky toys and often pounces on one and squeaks it ad nauseum for 5 or 10 minutes. She'll play fetch. Or rather, her own version of fetch, which consists of running for the ball and then taking off squeaking it (Dahlia will not play with anything that does not have a squeaker). She seems to understand play bows and has even been offering them herself to some dogs. And what has emerged is a very specific play style. 1. Cheerleaders (who play on the outside of a group who is more physically engaged and bark) -- these can turn into the dreaded "fun police" if not kept in check. I enjoyed reading her descriptions of these specific types of play as I've seen these dogs at the dog park and among the dogs we meet while out and about and while I didn't name them the exact same thing she did and while I didn't catch them all, I found my thoughts on dog play styles and hers were pretty much in line. Dahlia falls mostly into category 4 (chasers), with occasional bouts of 1 (cheerleader). The latter especially happens at the dog park, and I am afraid at times I think she's being the "fun police." If she thinks play is getting too rough she'll bark incessantly and sometimes body block one dog and herd him away from the other. Sometimes this is wonderful, especially when she herds a bully away from a more timid dog. Here you can see her being the "fun police" at the park. These two dogs were playing very roughly together. Dahlia rushed up and started barking at them. They stopped playing. Fun police wins. The lighter coloured dog (some sort of AmStaff or Pit Bull) kept trying to mount the Boxer. I'm not sure the Boxer enjoyed it, so perhaps Dahlia did the Boxer a favour. Here you can see her joyfully chasing another dog. She's also a soft touch. The one thing that I've noticed about Dahlia is that she can't handle the body slammers or wrestlers of the group. She doesn't do those; she doesn't play "bitey face." She's not a physical dog when she plays and, in fact, self-handicaps when chasing in order to not make contact with the other dog. A dog jumping on her will get a warning growl and occasionally an air snap if he/she doesn't get it right away. It has never progressed further than that as the vast majority of dogs understand what the growl means (and for those that don't, I step in and shoo them away!). 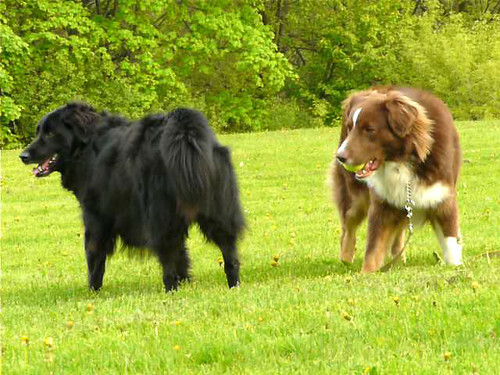 Recently Dahlia and I met an Australian Shepherd while out on a walk. He was of similar size to Dahlia and friendly, so we let them meet. I've never met a dog who was so identical to her in play style. We threw the ball for him, which he ran to get, Dahlia close on his heels. Once he got the ball, he stood still and squeaked it, some 20-30 feet away from us. And as we watched, he ran up to Dahlia, dropped the fall 5 feet away from her and waited. When she made a move toward him, he grabbed the ball and took off running in a huge arc, Dahlia at his heels. They did this several times, with his taunting her with the ball and her running after him. 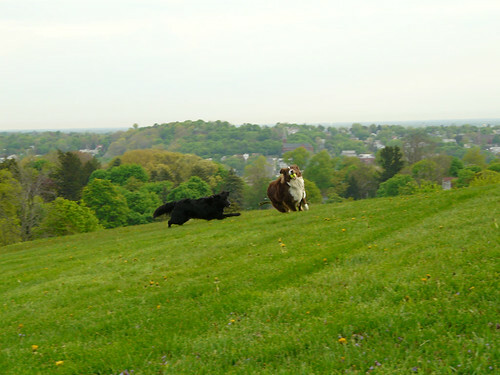 They even changed roles with Dahlia being the chased (which is rare for her as she likes to be the chaser). There was not one warning growl from her. The dogs did not come into physical contact except during the initial greeting ritual. It was perfect for Dahlia and, I'm sure, perfect for this Aussie friend of hers as well. It makes me think. When we do finally get a second dog, I'm going to be looking carefully at play styles, even more so than at size or breed. I don't want to have a wrestler who will make her uncomfortable. Of course, this means I'm setting myself up for a lifetime of chasers, cheerleaders, and soft touches, but there you have it!